In Michigan every community seems to have a winter festival, and Alaska seems no different. I didn't hear about any in December or January (probably too dark! ), but now have been hearing and reading about them often. I picked up the paper and noticed Anchor Point's Snow Rondi coming up, and on a whim asked Aurora if she wanted to be in the cross-country ski race. She did, so we made plans to visit the festival on our way to Ninilchik to visit my aunt & uncle for the weekend. We are glad we did, for it was a great, fun-filled afternoon. The kids both raced in the cross-country ski race and the biathalon. It was pretty casual. The race wasn't supposed to start until 1:00, but the lady said, "You're here, so you might as well race now," so the kids skied a loop to warm up, then raced the biathalon. It started with shooting a biathalon gun (no stock; looks like metal bars) to hit balloons, then racing the course, then shooting again. Points were given for hitting the target on the first shot, fewer points for getting it on the second shot. Denver took first in his age group, and Aurora got second. 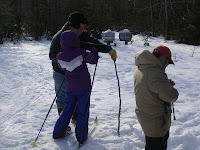 In the cross-country ski race both kids got first place finishes. 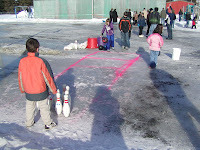 Then they headed to the local school where most events were held and played ice bowling. We watched the archery contest and snowshoe softball game while waiting for the coin hunt. This event is popular among the kids! The local VFW collects coins all year, dumps sawdust in a pile on the ground, pours some coins in it and the kids get to scrabble through it and keep what they find. 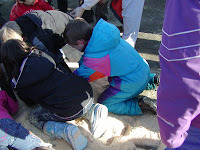 There are age groups, and for each successively older group more sawdust is added, as well as more coins. Both Aurora and Denver found about $4.50, and Denver even found a Sacajeweah. It was great fun to watch, as the little kids would find coins and drop them back into the pile, not realizing their significance. The older kids were intense about finding coins, but it was still fun. By Michigan standards, it would have been a poorly attended event, but I suspect by Alaska standards it was a great success. It is a 4-day event, has a wide variety of events (Pinewood derby contest, parade, dogsledding, snowmobile races, shooting, food every day and much more), and this year the weather was perfect. Some years there is no snow, and a lady told me the snowshoe race was converted to carrying your snowshoes and a glass of water. Whoever had the most water in the cup when they crossed the finish line won. Other years the temperature is way below zero. This year it was sunshiny and in the 20's, so we couldn't have asked for better weather. There were plenty of people there, but it didn't seem crowded. The kids are already asking if we'll be going back next year. Guess they want more trophies and candy bars for winning races!! And even though we've only lived in Alaska 7 months, I ran into many people I knew, so it ended up being quite a social event for me. Overall it is a fun event worth going to. With the full moon comes very high and very low tides, and it is fascinating to observe the change in the landscape as the tides go in or out. As we were driving into Homer Saturday we noticed the tide was way out, so we decided to stop by Bishop's Beach to check it out. 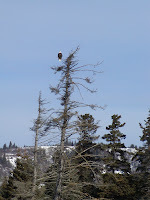 There is usually a bald eagle or two perched on a tree or soaring overhead. I took the above picture on Saturday, but a few days earlier I saw an eagle in the same tree with 10 crows surrounding it, perched on the tree. I'm guessing they get eagle leftovers. What is normally water with waves crashing over it becomes a huge sand flat firm enough for trucks to drive on (I wouldn't since I don't want the salt water corrosion that can result from beach driving) and people to walk on. It becomes a doggy playland, and on Saturday we saw dozens of dogs capering about, fighting and chasing each other. We lost a boot gripper that was on Aurora's boots while out walking the flats, but the tide was coming in so quickly that we had to get off the sand flats. 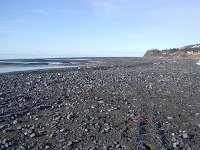 We did not find it before the tide washed into the area we had been walking on minutes before. I expected to find a lot of winter carnage: trash, kelp, driftwood and whatnot, but the beach was really cleaned off. There were some small sea plants and of course shells, but there were no large clumps of kelp and no trash either. Of course we'd just come off a really high tide, so everything had probably washed away. The picture of the volcano above is either Augustine or Douglas. 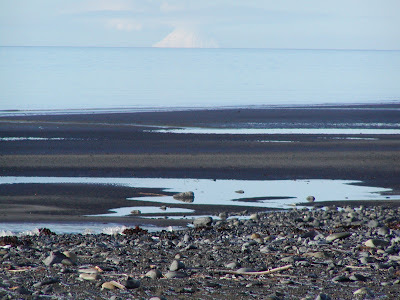 There are 4 large volcanoes across Cook Inlet from the Kenai Peninsula (Mt. Redoubt, Illiamna, Augustine & Douglas); this is the southernmost one. We seldom see it because it is usually concealed by clouds. Every time I leave the house, I look at my camera and debate whether I should take it along. Usually I don't because I don't want to leave it in the cold car or lug it around with me all day. I have missed many great photo opportunities as a result. The one last week was no different. Trash pickup doesn't exist in Homer. Instead, there are trash drop-off locations, which consist of a few huge dumpsters that everyone throws their trash into. They are free, and in strategic locations. I know of 3 in the Homer area. Ours is across the road from McNeil Canyon School. Last week when I pulled up to drop our garbage, I pulled into the parking area by the dumpsters and noticed a bald eagle standing on the ground across the parking lot, about 30 feet away. I threw my trash in the dumpster, keep an eye on it, not knowing if it might attack. It was unusual for it to just be standing there as I walked around and I've been attacked by a hawk before and didn't care for a repeat experience. The eagle continued to stand there as I got into my car, back up toward it to turn around, and then pulled up right next to it. I was sitting in the car with the eagle just outside the door and we eyed each other for a minute. Then it cumberously flew up onto the snowbanks surrounding the dumpsters. Obviously it had had enough of me, but it was a choice, rather than a fear reaction. It was checking me out too, and didn't care for this big metal object standing right next to it. I'm guessing this is a regular source of food for this eagle. Last week I saw an eagle on the electric post just above the dumpsters; it was probably the same one. I am consistently amazed at the lack of fear eagles (and other wild animals in Alaska) show for humans. It sure makes for some close encounters. And of course I'm regretting not having my camera every time this happens. I find one of the more entertaining features of Alaska is the houses. There is no building code for homes here, so people can (and do!) build some of the craziest houses. Besides Anchorage, which has its share of California-style cookie-cutter homes, I don't know if I have seen two homes that are exactly alike up here. Every house is a unique creation, and there is just no way to sum them up. Siding varies, from vinyl to log to Tyvek. An amazing number of houses up here have no siding, and haven't had siding for 20 or 30 years. They're just plain wood, weathered and looking very shack-like. Others are tar-papered, while for others the owners actually got as far as putting Tyvek on them. I've been inside some homes like this, and they are very nice and modern. If you saw a house in Michigan like that you would expect the inside to be as bad as out. Not so here. Other homes have the original logs from when they were built 30-40 years ago, chinked the old-fashioned way because that was the only way to do it back then. These logs were cut down, hauled, debarked, notched and set into place by the homeowner; there was no such thing as pre-done logs in those days. More than a few people live in 1-room cabins, shacks or 5th wheels year round. I have come across homes that do not have complete indoor plumbing or even electricity. I couldn't say if this is because the people want to live that way or because they cannot afford to live any other way. A number of homes do not have a well, as evidenced by a survey taken in our kids' school: "How do you get your water? a) city water, b) well water c) cistern d) truck. Water trucks are as common a sight as fuel trucks as they travel around the area filling up people's water tanks. Other people have no driveway and park in a pull-off by the road and walk to their house. For some this is just a winter problem, but for others they do this year round. Housing prices, the last we checked, were outrageous. We found one unfinished house with no water, electricity or road (gorgeous view!! ), 3 bedrooms, for $200,000. I think that was just a lot too, or small acreage. The house we lived in in Michigan would easily go for twice the price up here. For those who appreciate good architecture, houses up here are appalling. For those who like driving down the road and being entertained by the unique variety of buildings, this is the place to be! For a cross-country skiier, few things are as delightful as good snow, well-groomed trails, some people on the trail (but not too many) and a convenient location. I have found cross-country skiier heaven, or at least something very close to it! There are 3 complete cross-country ski trail systems around Homer: one is by our kids' school, the McNeil Canyon trails, then there are trails at Lookout Mountain, and more heading out of town towards Anchor Point. All are impeccably groomed for both skating and classical, with a nice mix of hills and flat. There is no fee to ski and no pay post. It has been years since I've ski skated because in Gaylord where we lived there were no trails groomed for skating unless you count golf courses and downhill ski areas, which are not my type of skiing. Now Aurora never wants to classical again since we got her skate skis for her birthday and she has skate skis with the XC ski club at school. The very best part of skiing here (besides 3 great trail systems and awesome grooming) is the views. Depending on which trail we're on there are stunning views of the mountains across Kachemak Bay, the bay itself, Mount Redoubt towering above Cook Inlet as well as expanses of tundra and what in the summer is unhikeable bogland. There is a labyrinth of trails so there's plenty of variety and we can take short loops for a quick ski or long loops for a trek. On top of the great trails, there are also groomed and marked snowshoeing trails, which I have dreamed of, but never seen. There are people out on the trails, but not so many as to feel crowded. Some people have old wooden skis with cable bindings while others have the flashiest new gear. Everyone just comes as they are and are comfortable being out there. The only thing more I could ask for is lighted trails, because the reason it took me this long to discover them is because it got light so late and dark so early and the window of opportunity each day was slim. 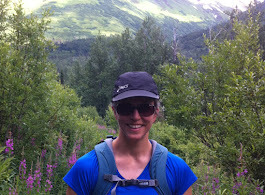 With lengthening days and 2 weeks of sunshine we finally discovered more trails. The roads are plowed just about as often as in Michigan. I've driven in a lot worse in Michigan, though the roads here are more dangerous because of the elevation changes, curves and dropoffs (no guardrails). I have seen no evidence of salt use on the roads anywhere in Alaska (doesn't mean they don't, but I've been looking and haven't seen the signs). Salt is used in parking lots and on sidewalks. I actually like this no salt thing; I've thought that they used way too much salt on the roads in Michigan. Gravel is the traction item of choice, and sometimes very large pieces of gravel flying around. Cracked windshields are very common here. Road conditions (and weather conditions) vary radically within a few miles depending on elevation or the presence of water, mountains or sunshine. We have never had studded tires or 4WD before, and with both of those, we are enjoying a higher levels of confidence driving in the winter than before. The studded tires, especially, make a big difference. Overall, the biggest difference here is that there are some very, very long stretches with no businesses, towns or civilization. Extra gas on board is a good idea and not something I would scoff at. It was with great excitement that I got the sun in my eyes at 9:35 this morning as the sun rose over the peaks. This is my view from my desk as I sit in the loft on the computer, and though I generally don't care for sunshine in my eyes, I appreciate every minute more of sunlight we get each day. The sky starts to lighten behind the mountains at about 8:00 for a 9:30 sunrise. The sunset is around 5:30 now I believe. According to my husband's last update, we are gaining about 4 minutes of sunshine per day. Funny that we didn't count the minutes in the lower 48. And the increasing sunshine is a hot topic of conversation, even for people who have lived here a long time. They say one never quite gets used to the very short days, and one never gets over appreciating the lengthening days. The sun is actually providing some warmth now too, which it didn't seem to a month ago. 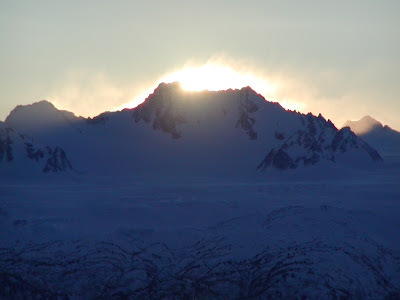 The peak you see in the picture is very often swathed in clouds that cover the Harding Icefield from which it comes. In this picture there is strong wind and the snow is blowing off the peaks creating the haze you see. A couple days ago a moose was hanging out on the steps of Homer High School. School officials tried to shoo it away, but it became agitated, so they called the police. The police came and shot it dead, in front of the high school, during school hours. Only in Alaska, huh? A moose was also hit and killed in another high school parking lot this week. The moose kill count on the roads in Alaska (might just be the Kenai Peninsula) was 110 a couple weeks ago, but as the winter goes on, grows higher and higher. We see so many moose we hardly blink anymore, though they are too large and unpredictable to ignore.